As part of Course Manager Matt Aplin’s strategy to improve the ecological footprint of the Goring and Streatley Golf Club, the ‘amazingly colourful results’ of sowing Euroflor wildflowers from Rigby Taylor ‘attracted as many complimentary comments about the outstanding display of colour as about the quality and performance of our greens’. Since Matt was appointed Course Manager at the Berkshire club in 2015 – after joining the greenkeeping team as an apprentice 20 years ago – he has constantly been looking for opportunities to improve the course’s ecological footprint and last year identified a rough area adjacent to the 14th hole that he wanted to improve. “I was bouncing my thoughts about the possible use of wildflowers off Gareth Acteson, Rigby Taylor’s area sales director, and he suggested that the Euroflor mix (rather than native species) might work better in that spot. Sarah Bouquet is a mix of 30 different species, including Anethum Graveolens, Borago Officinalis, Callistephus Chinensis, Helianthus Annuus, Helichrysum Bracteatum, Lobularia Maritima, Lupinus Nanus and Rudbeckia Gloriosa, and has a flowering height of 70-90 cms. 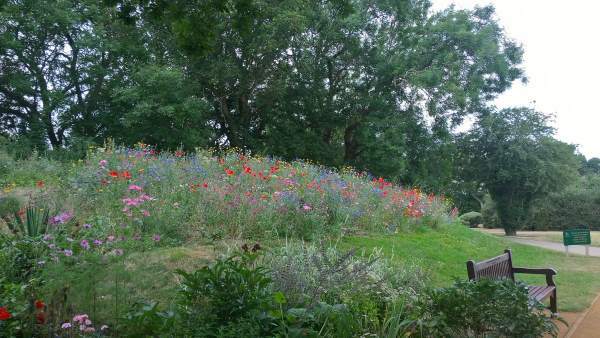 “We didn’t do too much preparation for sowing the wildflower seeds and we undoubtedly over-sowed in terms of seed ratio, but the impact was tremendous from June right through to October. Another way in which Matt recovered some of the cost of the outlay on seed was to re-sell small Discovery packs (also supplied by Rigby Taylor) of the wildflower seeds. “After seeing the flowers a number of members wanted the seeds for their own gardens,” says Matt.